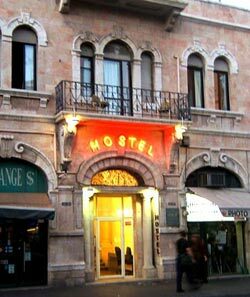 We stayed at the Jerusalem Hostel (+972 2-6236102) in Zion Square. We really liked it. It was 280NIS/night for a double room. Had decent A/C (without individual control), free wifi (but not in our room), a balcony in the room and a really nice roof deck. They seem to have some bread and instant coffee for free for breakfast, but we didn’t partake in a kitchen where you can cook for yourself. They also have a washing machine for 15NIS with line dry. I would certainly go back. There is nothing fancy or luxurious about the place but it has all you need for less than half the cost of a regular hotel. They also certainly were not trying to nickel and dime you like certain other tourist operations. Only thing I would request is they put in one of those water filters/chillers to fill your Nalgene…I’m assuming the tap is safe, but those would at least taste better. The staff was very friendly, though the best part about the place was its location. It is in the dead center of Zion Square on Jaffa Road where Ben Yehuda hits it. I would recommend staying in Zion Square when visiting Jerusalem. It is about a 10 minute walk to the old city gate, but is still alive at night. You have tons of falafel and Shawarma shops, stores, restaurants and bars right there.